The ACT Government wants the Federal government to offset the cost of removing asbestos waste that has been dumped throughout Canberra. 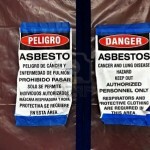 Recently, asbestos was discovered when an old sports field was being upgraded. Various asbestos irrigation pipes were uncovered and it was revealed upon further investigation, that a larger area was contaminated.This discovery is only the most recent, in a set of asbestos related issues lately.Environment Minister Simon Corbell believes there is a possibility of other contaminated sites being discovered. He also stated that these sites are the result of poor building practices, whereby waste was dumped in the most ‘convenient’ spot. Questions have emerged concerning the handling of the dangerous material that has been uncovered. Corbell believes that the Federal Government needs to contribute to this disposal of this waste since he believes the pollution to be caused under the “Commonwealth’s watch”. A representative from the Master Builders Association claims that workers are learning how to deal with and increase awareness of asbestos.